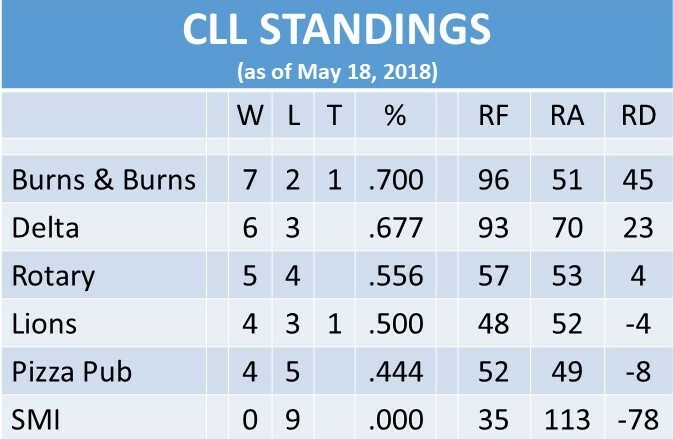 (By CSZ Sports Writer Kenn Staub) Back to the Clarion Little League (CLL) “beat” and starting the process of bringing readers up to speed on what’s happened since I last posted (coverage of Week 4 posted Monday, May 14). Sorry for the delay. What can I say in excuse but “life”. I’m sure it’s something all Little League parents, past and present, are able to find relatable. The fifth week of the CLL season was “chock full” of doubleheaders, necessitated by a midweek dance at Clarion and concert at Clarion-Limestone. Twin bills were played on Monday (May 14), Thursday (May 17), and Friday (May 18). In one instance final results are still pending, as the second game on May 17 was “timed out”. Burns & Burns (Away) took advantage of two runs in the first and five in the second, while shutting out Rotary (Home) over that same span, to jump to a 7-0 lead. The Burns onslaught continued in the third, as the David Smail managed team added another four. Rotary responded with three in the bottom of the frame, making the score 11-3. 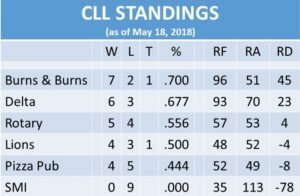 Burns posted three runs in the top of the fourth and then kept Rotary off the board to secure a 14-3 “ten-run rule” victory in a battle of the top two teams in the league. Burns ran their record to 6-2, with Rotary dropping to 5-3. Burns pounded out ten hits. Dawson Smail (two singled, triple), Kothan Smith (two singles), and Ty Rankin (two singles) enjoyed multi-hit games. Derek Smail doubled. Reese Runyan and Kam Kerle both singled. Dawson Smail led the team with four RBI. Derek Smail and Smith plated two and Rankin one. Rotary had four hits, all singles. Tommy Smith was good for two hits and an RBI. Bryce Brinley and Owen Kreibel each chipped in a hit. The second game on May 14 was also a “ten-run rule” victory, though it took Pizza Pub (Away) five innings to put away SMI (Home). The team’s exchanged runs in the first and played a scoreless second, knotting the game at 1-1 heading to the third. Pub went off for six runs in the top of the third and added four more in the fourth to take an 11-1 lead. SMI fought back, plating two in the bottom of the fourth to make the score 11-3. Pub, however, tallied two in the fifth while shutting out SMI to set the final at 13-3. Singles were the rule of thumb for Pub. Parker Miller connected for two, as Kohen Kemmer, Nick Aaron, Ethan Rex, and Hayden Hindman all rapped one. Miller and Aaron received credit for two RBI. Daunte Girvan tripled for SMI. Brayden Murray, Jack Craig, and Wyatt Watterson all singled. Murray, Craig, and Watterson all batted in runs. Pizza Pub’s record improved to 3-5. SMI fell to 0-8. Delta Contractors (Home) handed SMI (Away) their second “ten-run rule” loss of the week. SMI opened the scoring, plating a run in the top of the first. Delta countered with three in the bottom of the frame and then scored six in the second and three in the third while blanking SMI to take a 12-1 lead. Rather than hang their heads, the boys in the SMI uniforms got things going their way in the fourth, scoring seven and in the top and then shutting out Delta in the bottom, making the score 12-8. SMI would, unfortunately, be unable to score again and Delta had six more cross the plate in the bottom of the fifth for the 18-8 win. Following the game Delta’s record stood at 6-2 and SMI’s at 0-9. Brayden Murray wielded the club for SMI, pounding two homers, a single, and knocking in three. Ben Aaron connected for two singles and Jack Craig a double. Owen Wilson had his first Little League hit in the game, a single. He also drove in two. Two Delta players fell just a hit shy of the cycle. Jase Ferguson needed a triple, having hit a single, double, and grand slam. Jesse Siwiecki came up a home run short, rapping a single, double, and triple. Ferguson plated five and Siwiecki three. Kaden Ferguson had two singles and three RBI, Logan Lutz a double and two RBI, and Bryce Brinkley singled. Thursday’s nightcap was abbreviated owing to time limit regulations at Paul A. Weaver Park (no inning can be started after 10:00PM). Because of this, the game between Burns & Burns (Away) and Lions (Home) ended in a baseball rarity, a tie score. As of this writing know determination has been made by CLL regarding if or how this game will be concluded. Those in attendance were treated to a dandy. Burns scored two in the top of both the first and second, with Lions tallying one in the bottom of these same innings, making the score 4-2. Lions shut out Burns in third, scoring two themselves to knot the game at 4-4. Burns forged ahead with one in the fourth and then kept Lions from scoring until the bottom of the sixth. With their backs to the wall, Lions managed a single tally to tie the game 5-5 and send it to extra innings. The teams played a scoreless seventh before the game was halted. Burns’s Devon Lauer had three hits, two singles and a double. He drove in two runs. Derek Smail and Ty Rankin knocked two singles apiece. Dawson Smail and Kam Kerle singled. Dawson and Derek Smail each accounted for an RBI. Gabe Simko brought the power for Lions, smacking two solo home runs, good for two RBI. Lions other five hits were singles. Brady Pierce had two and Lucas Mitrosky, Hayden Weber, and Brayden Beckwith one apiece. Kohen Kemmer pitched three innings for Burns, striking out 2. Lauer struck out nine in his three and a third innings and Derek Smail fanned one in a third of an inning. Simko was also the pitching star for Lions, fanning ten while giving up but a single earned run in four and a third innings. Mason Gourley pitched two and two-thirds, punching out four. Burns concluded the evening with a 6-2-1 record, Lions with a 4-3-1 mark. Burns & Burns (Home) led wire-to-wire in coming away with an 11-4 victory over Delta Contractors (Away). Burns scored four in the first, two in the second, and three in the third to bolt our to an early 9-0 lead. Delta showed life in the top of the fourth, scoring three, but Burns added another two when they came to bat, making it 11-3. Delta plated a harmless run in the sixth to make the score 11-4. Burns, playing in their third game of the week, finished Week 5 with a 7-2-1 record. Delta was 1-1 on the week, setting their overall record at 6-3. Jimmy Kerr doubled for Delta. Logan Lutz and Jesse Siwiecki each singled. Burns’s Dawson Smail hit a home run and was responsible for three RBI. Derek Smail doubled and Devon Lauer, Kothan Smith, Dylan Smail, Ty Rankin, and Reese Runyan singled. Gabe Anderson recorded his first Little League hit, a single. Like his brother Dawson, Derek Smail also had three RBI. Smith chipped in one. Delta had three hits, a double by Jimmy Kerr and singles off the bats of Logan Lutz and Jesse Siwiecki. The week concluded with one of the closer and mores suspenseful games, Pizza Pub’s (Home) 4-3 win against Rotary (Away). Rotary took a 1-0 lead in the top of the first, but Pub plated three when they got their chance, making the score 3-1. The second was scoreless, but this actually marked the start of Rotary clawing its way back into the game, as they would keep Pub off the board for the next four innings. In the meantime, Rotary began chipping away at Pub’s lead, scoring one in the top of the third and fifth, knotting the game 3-3 heading into the sixth. Rotary was unable to score in the top of the sixth, a lapse which would prove costly when Pub plated one in the bottom to win the game. Tommy Smith had Rotary’s only multi-hit game, collecting a home run and double. He was good for three RBI. Owen Krieble and Brady Quin both singled, with Quinn receiving credit for an RBI. Matt Alston ripped a double and single for Pub. Kohen Kemmer and Tanner Miller had two singles apiece. Ethan Rex doubled and Parker Miller added another single to Pub’s hit total. Rex plated two. The win was Pub’s second of the week, upping its record to 4-5. This was Rotary’s second loss of the week, dropping the team to 5-4.